Before we learn how to make rugelach, let us talk a little about it. Rugelach is actually a Jewish pastry. The original dough recipe was made with yeast requiring time for kneading and rising. Often this yeast dough is rolled and spread with butter several times making it very rich and flaky. This is much like we make our puff pastry dough. 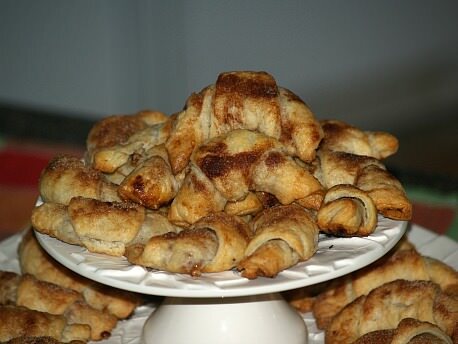 Today, rugelach dough is often made with sour cream or cream cheese and no yeast. Although these recipes are good and easier to make, they are not the same as the original yeast recipes. As you are learning how to make rugelach, no doubt you will run across recipes with many different spellings. Recipes spelled “rugalah”, “rugalach”, “rugulach”, “rogelach” and other similar spellings are basically the same. What Jewish people in Israel call rugelach or rugala for singular, in other countries could be listed under totally different names. Jewish people who settled in other countries continued to make this delicious pastry wherever they lived. In Germany and Austria you will see it called “kipfel” and in Hungary and Yugoslavia it is called “kifli”. After I learned how to make rugelach, I saw recipes using the dough to make cookies, cakes and various sizes and shapes of pastries, The name seems to mean “twists or rolled things” so I am sure this is why most recipes are “rolled” in one way or another. All the recipes which I have seen and used contain some type of filling; raisins and other fruits, nuts, chocolate, cinnamon, poppy seeds or preserves. 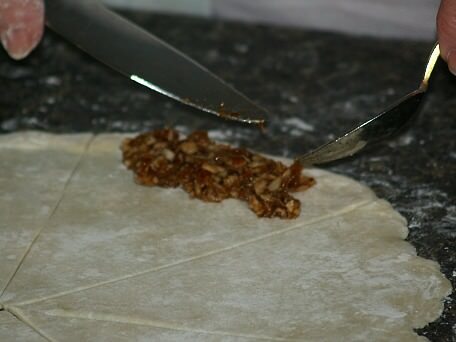 To hold the filling, the dough can be rolled into small triangles or in larger rolls like the strudel is made. 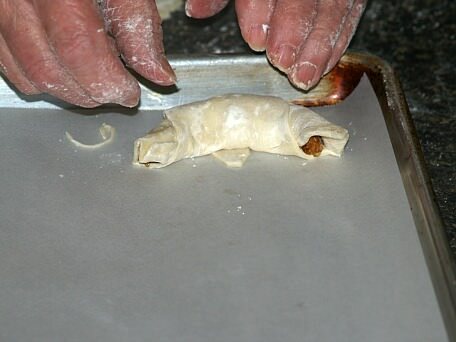 To make the traditional rugelach, the dough was rolled and cut into triangles. 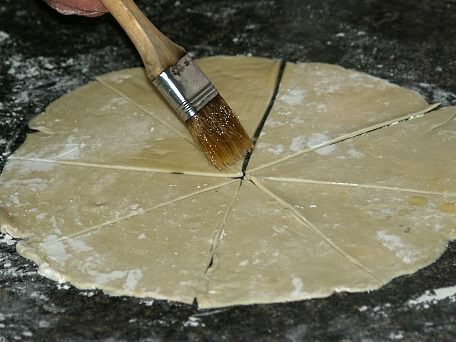 After placing the filling on the dough, it is rolled up starting at the wide end and rolling to the point. After rolling it typically is bent into a crescent shape and then is baked. These “traditional cookies” are still the most popular pastry in all Jewish communities. The idea of making this pastry was brought to the United States by immigrants arriving here from those communities in other parts of the world. It was here that bakers made up other less complex recipes for the dough without the yeast. Some of these simple recipes are even known by the simple term “cream cheese cookies”. Combine 1 cup butter and cream cheese in a large bowl; beat on medium speed until smooth. Knead in enough of the flour to make a stiff dough; cover with plastic wrap and refrigerate for 1 hour. 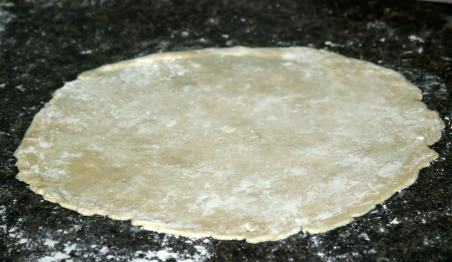 Roll ¼ of dough out on lightly floured surface to 11 inch circle. Brush circle with melted butter; cut circle into 8 wedges. Spoon 2 teaspoonfuls filling in the center of each wedge. Roll up starting at short end rolling toward the point. Place point down on ungreased baking sheet; bend into a crescent shape. Combine sugar and cinnamon and sprinkle over cookies. Bake 15 to 20 minutes or until lightly browned; immediately remove from baking sheet. 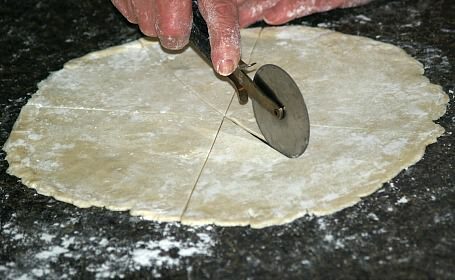 Continue rolling and shaping remaining ¾ of the dough. 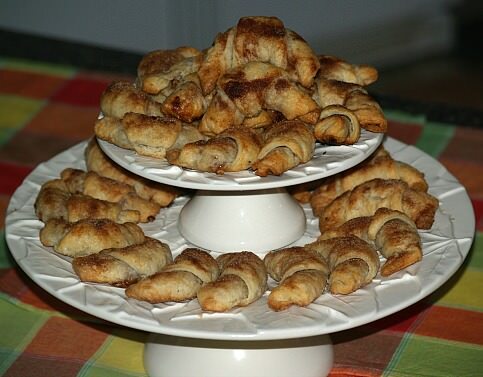 If you are learning how to make rugelach, start with this easy recipe. Combine and blend all ingredients with hands; roll into about 80 balls a little larger than a grape. Roll balls to the size of a small saucer; place ½ teaspoon apricot preserves on top of dough. Roll dough covering preserves into little log; bend and shape like a crescent. Place on baking sheet and bake 12 to 14 minutes; dust with powdered sugar. This kifli dough is the same as when learning how to make rugelach. TO MAKE DOUGH sprinkle yeast in flour; cut in the butter until crumbly. Add to the flour mixture the yolks, sour cream lemon peel and lemon juice. Work mixture into a dough; shape into 14 balls. Cover dough with plastic wrap; chill overnight. PREHEAT OVEN TO 400F degrees; grease and flour baking sheets. TO MAKE FILLING beat egg whites on high speed until soft peaks form. Gradually add sugar beating until peaks are stiff but still moist; fold in walnuts. Dust work surface with powdered sugar; roll balls to the size of a large pie plate. Cut dough into 8 pie shape wedges; place a teaspoon of filling on the wide end of wedges. Starting at the wide end of wedge, roll over the filling toward the point. Shape roll into a crescent and place on prepared baking sheets. Bake about 15 minutes until light brown; cool. In a large bowl beat butter and cream cheese on medium speed until smooth. On low speed gradually add flour beating just until dough forms. Divide dough in thirds and flatten into disks; wrap each in plastic wrap and refrigerate at least 1 hour. Take out 1 disk of dough at a time; roll into a 14 inch circle. Take out 2 tablespoons of the sugar cinnamon mixture and reserve. Sprinkle the circle with ¼ cup preserves leaving ¼ inch border. Sprinkle with 1/3 of the remaining cinnamon sugar mixture and 1/3 of the raisins and nuts. With knife or pizza wheel cut circle into 16 wedges; roll up from wide side to point. 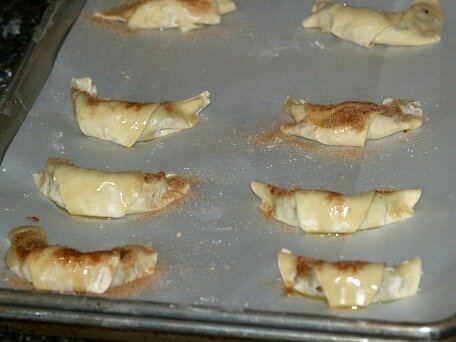 Place point down on tray and shape into crescent; sprinkle each with 1/8 teaspoon of reserved cinnamon mixture. Bake 18 to 22 minutes until golden brown; cool completely on rack. Learn how to make rugelach with a poppy seed filling. Sift flour with sugar into a large bowl; sprinkle yeast over top. Beat sour cream with the yolks; mix into flour mixture. Place on well floured work surface; roll into a square. Cream butter with 1 cup of flour; spread in the middle of the dough square. Fold square envelope style; chill for 20 minutes. Repeat this roll, fold and chill process 4 more times. Divide dough in 4 parts; wrap each in plastic wrap and remove 1 part at a time from refrigerator. Roll each part in a circle; spread with poppy seed filling, roll and shape into crescents. Place on ungreased baking sheets; bake 10 to 15 minutes and cool completely. Combine in a medium saucepan 2/3 pound freshly ground poppy seeds, 1 ¼ cups of sugar, ¾ cup milk and ½ cup butter. Cook over low heat stirring constantly until mixture slightly thickens about 5 minutes.